Like stories of changeling children, stories about phantom black dogs are hard to miss. From Padfoot in the Harry Potter series to appearances in webcomics and Sir Arthur Conan Doyle’s Sherlock Holmes, phantom dogs are simply everywhere you look, with myths and legends varying slightly across the British Isles over time. And even though a simple google search yields over a dozen names for these hounds, many share some common features. Traditionally, these black dogs are seen as ill omens, bringing with them death and bad luck. It’s no wonder, then, that many are often lumped under the umbrella term “hell hounds” without further distinction. And physically, they are very similar – the most common description is simply a large dog, often the size of a calf, with shaggy black fur and “saucer” eyes. Often, it’s only when the hound disappears that witnesses realize they’ve seen a phantom at all. When the context of these sightings is taken into account, some differences begin to emerge. Many appear firmly rooted in spaces closely linked to the dead and the past, such as graveyards and ruins. But others are found in lonely places, ancient paths and crossroads, reportedly either protecting those passing through from thieves or serving as visible guardians of the unseen world. It’s these more benevolent cases that makes it difficult to justify, in my mind, lumping all phantom dogs into the “hell hound” category, and indicate appearances can often be deceiving. The Black Shuck was one of the first Phantom Dogs I stumbled upon when I started sifting through accounts years ago, and its legacy still persists in modern times. Hailing from East Anglia, the hound fits the typical Black Dog description, and is believed to have stemmed from a mix of Norse and Celtic myths. This hound is certainly one of the more malevolent ones, with glowing red eyes and reported supernatural abilities. The best known account of the Black Shuck comes from Bungay, England in 1577. As parishioners gathered for service one Sunday in August, a large black dog appeared in the midst of a violent thunderstorm. It burst into the church, stirring panic in its wake, and reportedly killed two men kneeled in prayer instantly when it passed between them. Later that day, the hound was seen again at a second church, roughly seven miles away in Blythburgh. During this second incident, two more men in the belfry were killed when the church tower was struck by lighting. To this day, scorch marks can be seen on Blythburgh Church’s door, reportedly from the incident. Moddey Dhoo, artist unknown. Image Credit: Cryptid Wiki. The Moddey Dhoo comes from Peel Castle on the Isle of Man, and is mainly associated with one story from the castle’s past. Legend has it a large black dog would appear after the guards locked the castle gate each evening. But unlike the Black Shuck, its presence was peaceful – it merely walked into the guards’ room of a night, curled in front of the fire, then rise and exit by the same passage shortly before the gate was unlocked at dawn, oblivious to the guards’ terror. After its first appearance, the men decided that, when they walked to the captain’s chambers to return the gate key each night, two men should go rather than let any one of them make the trip down the passage alone. This continued for some time, until one of them guards got drunk one night and decided he’d return the key by himself, even though it wasn’t his turn and his companions begged him not to. He challenged the dog twice to follow him and reveal itself as either a flesh and blood creature or a phantom, and sure enough, it silently rose and followed him. The other guards heard his screams, but when he staggered back minutes later, he never revealed what had happened in the passage. He died three days later, still without uttering a word about the ordeal. The dog didn’t appear for the guards again, and the passage, reportedly once part of an ancient church, was later sealed. And ironically enough, the remains of a large dog were found on the grounds, buried at the feet of a bishop who died in 1247. Artist unknown. Image Credit: sleepingmoon333 on Tumblr. Church Grims perfectly fit the black dog archetype, but are generally less malicious than the Black Shuck. They actually have more in common with the Moddey Dhoo, as they’re always connected to old churchyards and cemeteries. Grims are generally considered guardians, tasked with protecting the souls of those buried in their domain. How these spirits assumed their role, however, isn’t pleasant. Different traditions at the time held that either the first or last being interred in the cemetery would be forced to serve as its guardian for all eternity. To prevent this burden from binding a human soul to a purgatory-like state, an animal (usually a dog) would be sacrificed and buried, often while still alive. Image Credit: DeviantArt user CyberSunbeam. From the Scottish highlands comes the Cu Sith, a bit of an outsider among Britain’s phantom hounds. Unlike the other dogs discussed here, its shaggy fur is green rather than black. It’s believed this is because the Cu Sith is, quite literally, a fairy dog. These are the silent hunting hounds of the fae, often said to be “as large as a two-year old bull … [with feet] as broad as a man’s chest.” Their sharp barks are said to be heard for miles, but they only call three times – twice as a warning, but to hear it a third time is believed to herald death. 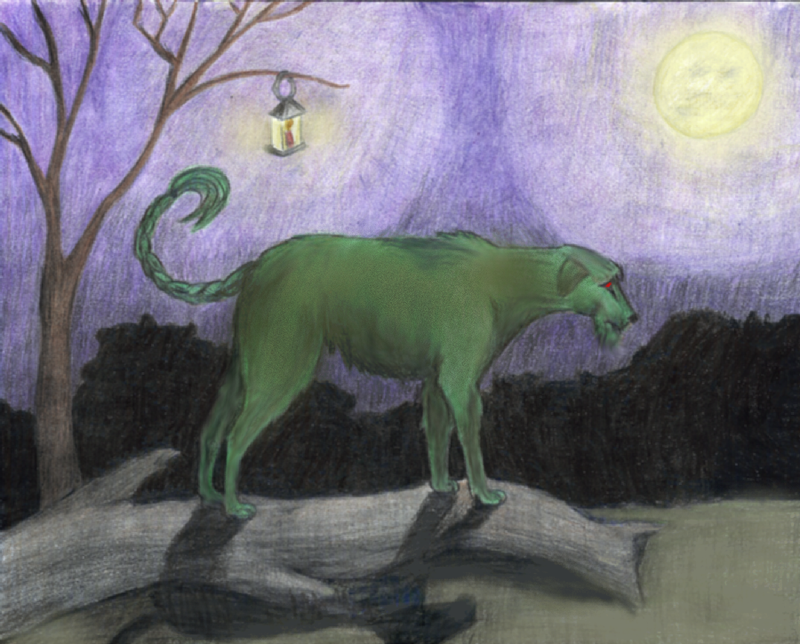 My own stories feature different nods to Britain’s hounds – Sheridan, a constant companion throughout the series, was heavily influenced by tales of the Black Shuck in his first incarnation. Through rounds of rewrites, he’s adopted more Cu-Sith influences, but his character’s old ties to Britain’s other hounds is still evident in his coat color, something that will become more evident as the series progresses. From Shakespeare’s A Midsummer Night’s Dream to Julie Kagawa’s Iron Fey series, changelings are everywhere. Even Supernatural has an episode revolving around these fae, and there are countless other examples out there if you take the time to look. These stories span both centuries and cultures, but all boil down to the same central theme – a human, usually a child, is abducted by an otherworldly being and replaced with a surrogate. Changelings are most easily spotted by their mannerisms. Temperamental and fussy, they have a ravenous hunger and will eat anything in sight, even the family’s luck and good fortune. But despite constant gorging, the child never gains weight and remains sickly. Many are said to look inhuman, with bony arms and legs, and eyes that hint the “child” is much older than it appears. Iron placed around a baby’s crib was one way to prevent the switch from occurring, taking advantage of fae’s well known aversion to the metal. Laying a piece of the father’s clothing across a sleeping child also offered protection. Baptism sometimes served as the ultimate ward against the fae, stripping them of any power they may have held over an individual. Various methods claimed to return the abducted; boiling water in eggshells to force the changeling to expose itself is perhaps the most harmless of these. The worst involved torture – physical beatings, poisoning with foxglove, leaving them outside overnight, and throwing them in a lit fire or hot oven were all considered appropriate ways to deal with changelings. Tragically, it’s believed that children born with developmental disorders were often labeled as changelings. Folk belief and superstition were often the only tools available to explain why some children are born with handicaps, and unfortunately, commonly led to infanticide. It would be far more comforting to believe these tales are found only in the distant past and fictitious works, but unfortunately that’s not the case. In 1895, Irishman Michael Cleary was found guilty of manslaughter after brutally torturing and eventually murdering his wife, Bridget Cleary. He claimed that it was not his wife he burned alive, but a faerie changeling, left in her place. Bridget was 26 years old when she fell ill with mild bronchitis. Described as both beautiful and thrifty, her one “flaw” was that she hadn’t given Michael any children. But she was a loyal wife – no one believed her to have cheated – and, presumably, a caring daughter, as her father lived with the couple. Multiple warning signs were visible in the days leading up to Bridget’s death, but no actions were taken to prevent the inevitable. Bridget Cleary and her husband, Michael. Image Credit: Irish Central. She endured torture for at least three days, ranging from being placed over a hot fire grate to beatings, having urine thrown on her and being force fed slices of dry bread without drink, all with witnesses present. Even as neighbors reportedly pleaded with Michael to stop, he insisted the woman before them was not his wife, but a faerie. Three days after a doctor gave him herbs to treat bronchitis, something Michael “had no faith in,” Bridget was burned alive and buried over a mile from their home in Tipperary. Her body wasn’t discovered for six days, and the original charge of murder brought against Michael was reduced to manslaughter. Bridget Cleary’s case shows us the dangerous superstitious beliefs fairy tales and folklore can give rise to. Today, we widely accept that what happened to her and countless others accused of being changelings or in league with the devil are acts of barbarism, though these crimes were once viewed as appropriate responses to unexplainable circumstances. It makes one wonder though – what practices common today will gain similar reactions from future generations?